Prime Landscaping offers full project management from inception to handover. We work closely with the client to ensure complete satisfaction. All projects are undertaken with strict quality control measures which ensures the job will be undertaken properly the first time, and on budget. 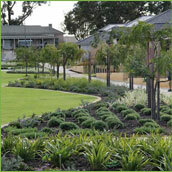 Prime Landscaping has been involved with the successful completion of many commercial landscapes. 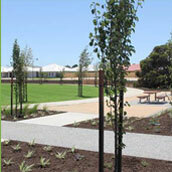 Projects completed include streetscapes, parklands, children's playgrounds, public open spaces, entry statements, bushland revegetation, school playgrounds, educational & community facilities. We have worked for and with a diverse range of clients including developers, architects, local councils, schools, government departments, and commercial businesses.